I had an old box I used for crocheting hooks, needles, etc. I decided to give it a new look and to decoupage it. The first step is (as always) to use some sandpaper and even it up a bit. BTW, I have started a new squido lens http://www.squidoo.com/decoupage-tips and you can find some decoupage tips there. 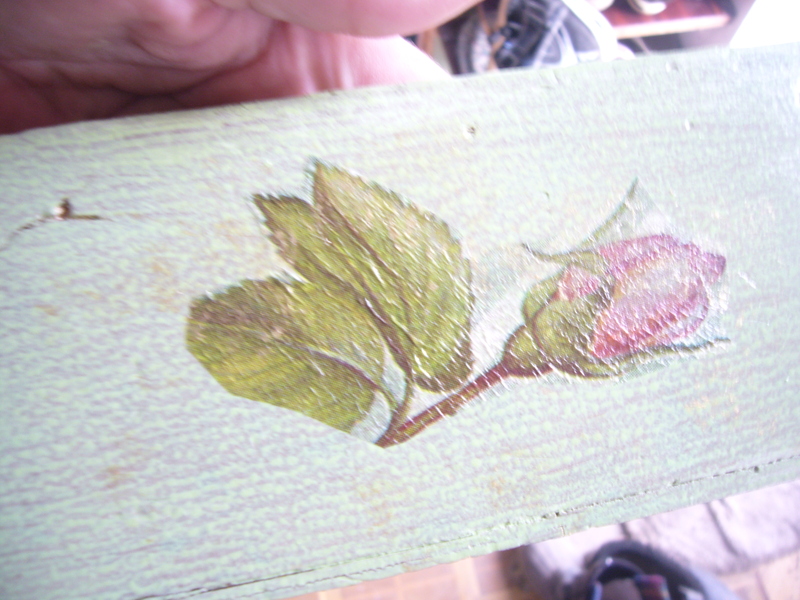 Then I repainted the box just once. I was already painted with the golden paint. I wanted it to be in sort of shabby chic style. So, I painted it just once. Now, I tried various ways of applying napkins to the surfaces. Here is one that works better for me. Once the pain dries up, I take a brush and rub a bit of transparent wood polish onto the surface. I put just enough to wet it a bit. Then I stick the napkin on it and carefully get all or most of the air bubbles out. 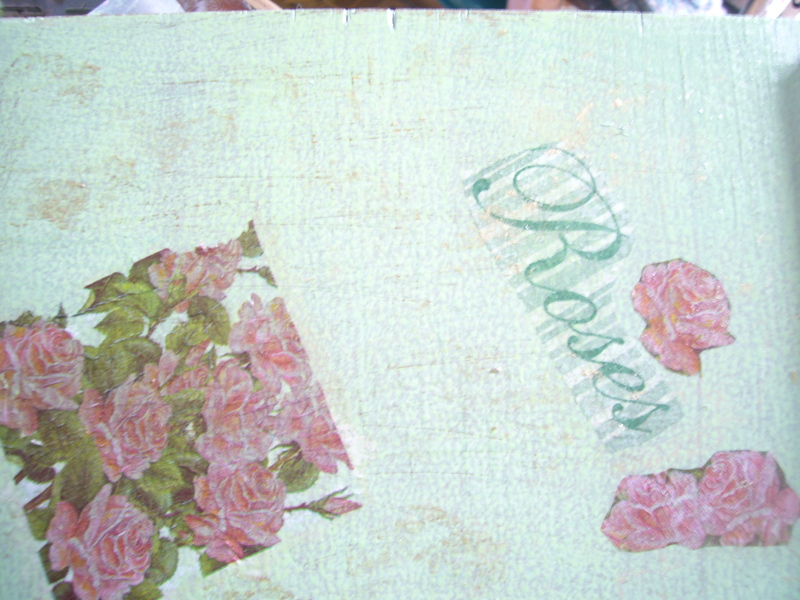 This is the box top with decoupage roses on it. When the napkin gets well adjusted to the surface, I use more polish to cover it up. Then I polish the entire surface and let it try. I apply polish several times, letting it dry up every time. 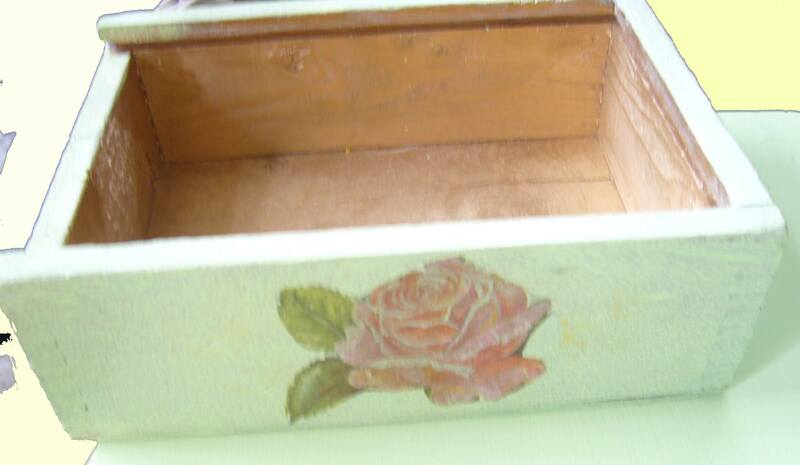 That’s my simple decoupage how to for this box. This entry was posted in Uncategorized and tagged box decoupage, crafts, decoupage, decoupage how to, decoupage tips, handmade, home decor, home design, home design ideas, how to decoupage, napkins, shabby chic. Bookmark the permalink.